In Toronto’s downtown banking district is a group of six office towers and a pavilion, together characterized by their straight lines and dark steel, which make up the Toronto Dominion Centre. 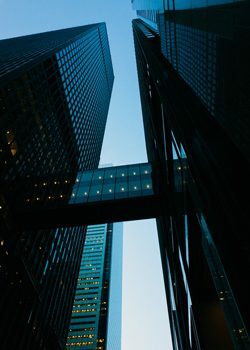 The TD Centre is the global headquarters of the Toronto-Dominion Bank and rents out space to other businesses, but the buildings themselves can be just as interesting as what is inside them. 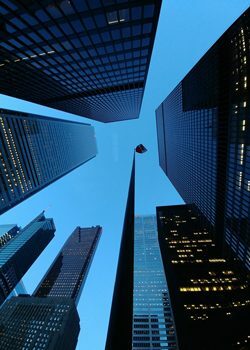 Started in 1967, the TD Centre dramatically changed Toronto’s approach to both office buildings and the downtown core. In the 60s, most of Toronto’s downtown buildings were grey stone and featured more classical elements, such as arched windows, columns, and gargoyles. The tallest of these old buildings was the Bank of Commerce at 36 stories. The TD Centre was a complete shock. Originally just two towers and the pavilion, the taller of the towers was 56 stories high. Instead of the design themes characteristic of its surrounding buildings, this new complex was the epitome of simplicity. Their facades were rigid lines of bronze-tinted glass and steel painted matte black. 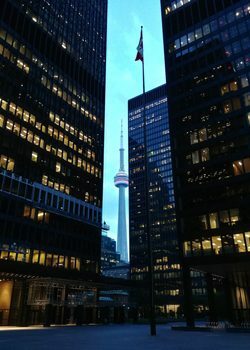 At first, some local politicians were skeptical of the buildings and felt they didn’t belong in Toronto, but they marked the beginning of the office tower boom in the downtown and it is now hard to imagine the area without them. The designer of these influential structures, Ludwig Mies van der Rohe, was born in Aachen in western Germany in 1886. Often referred to simply as Mies, he was one of the best-known architects of the 20th century and a pioneer of modernist architecture. His father was a mason and he grew up sometimes working on construction sites, but he never received any formal education in architecture. Instead, he started apprenticing with architects from the age of 15. By 21, he was awarded his first commission, a private house, which caught the eye of Peter Behrens, who was one of Germany’s most prominent architects at the time. Mies went to work for Behrens, where he started to develop his architectural style. He earned a reputation as a member of the modernist school and was appointed director of the Bauhaus school in 1930. Mies moved to America in 1937, finding it difficult to work in the Germany of the 30s. It was in the U.S. that he started getting regular commissions for large-scale works, such as the Seagram Building in New York City. He became one of the undisputed leaders of minimalist architecture. When Mies was commissioned for the TD Centre, he was given almost complete free reign. He actually only designed the first two towers and the pavilion, as the remaining four towers were added later, but they were built to respect Mies’ original plan. His vision is still maintained today - visitors to the TD Centre can find bowls of yellow daisies in the lobbies, which was one of Mies’ design details.